THE MEN AND WOMEN of the National Alliance believe that the future is what we make it. We believe that we, as free and conscious agents, have an absolute responsibility for all those elements of the world around us over which we are capable of exercising control: for the structure of our society and its institutions; for the beauty and cleanliness of both our natural and man-made environments; for the cultural and moral climate in which we live and work; for the military and geo-political status of our nation relative to the other nations of the earth; and, most of all, for the racial quality of the coming generations of our people. We believe that no multi-racial society can be a truly healthy society, and no government which is not wholly responsible to a single racial entity can be a good government. America’s present deterioration stems from her loss of racial homogeneity and racial consciousness, and from the consequent alienation of most of our fellow citizens. We believe that a good government is a government firmly based on fundamental principles, the first of which must be that the long-range welfare, security, and racial quality of our people is the ultimate good. A good government is a government which implements continuing, farsighted programs consistent with this principle; it is not a government like the one we have now, which embodies no coherent national purpose, which is swayed by every minority pressure group, and which bases its policies on shortsighted, partisan considerations, drifting from one crisis to another and seldom planning beyond the next election. “Toward a New Consciousness; a New Order; a New People.” In these ten words we sum up the raison d’etre of the National Alliance: We work daily for a new understanding among our people of their place in the universe; for a new government embodying our values; and for eternal upward progress toward higher man. Our symbol, the Life Rune, comes from an ancient alphabet, or futhark, used in northern Europe for many centuries before the general adoption of the Roman alphabet there. It signifies life, creation, birth, rebirth, and renewal. We believe that, in addition to a principled, responsible government, we must have a society which facilitates progress in all realms of life: that is, a society whose institutions and values are conducive to advancement not only in material efficiency, but also in artistic achievement, in moral and physical health, and in racial quality. And we believe that all of these things are closely bound together. We can have a healthy, vital artistic life once again only when we reject the false notion of artistic universalism and encourage our young artists and musicians to express the inherent values and feelings of our own people in their creative work. Likewise, our educational system should concern itself not only with training our young people in the basic skills of civilized life and giving them pride in their racial, cultural, and national heritage, but also with building character in them. Self-reliance, moral toughness, a sense of personal honor, and physical fitness are qualities at least as important in our citizens as a knowledge of facts and techniques. All young people of our race must have instilled in them a sense of quality instead of equality; they must be taught to embrace discipline and order instead of being encouraged to succumb to permissiveness and chaos. We believe that our people must be united by the common goal of building a better race. Today, without a common national-racial purpose, we are unable to focus our energies and achieve the great things which otherwise would be within our grasp. But once we are united on the basis of common blood, organized and disciplined within a progressive social order, and inspired by a common set of ideals, there will be no problem which we cannot overcome, no enemy whom we cannot vanquish, and no goal which we cannot attain. We believe that the first step toward this goal must be the gathering together of all those men and women of our race who share our beliefs and who are willing to participate in our effort to raise the consciousness of others. 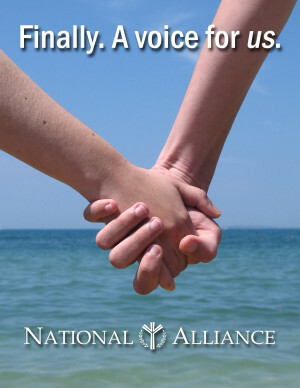 First: The prospective member should carefully read and understand our introductory document, What is the National Alliance?